These last few years have been a salve seeking journey. Seeking truth and guidance like a salve for the dry and parched chafing of my heart. Honestly it wasn’t that poetic. There were days…oh there were days. But, with God the latter days will be greater than the former. Don’t ever dismiss the deep ponderings and searchings of your heart. Allow Him to fall on those dry places and renew your spirit. It’s true that you can “soar like wings of an eagle” but you’ve got to be willing to take the flight. My husband and I attended what our church calls Kairos (an ancient greek word meaning right, or opportune moment) a few years ago and during one of the sessions, we looked at each other and asked, “what makes something a sin?” We really wanted to be able to identify the “sins” in our lives; other than the obvious 10 in the OT. Now I’m not saying we were necessarily ready to give them up but we at least wanted to know what they were. Maybe we didn’t have any!?! Later that day, walking through the halls, I ran into one of the women pastors and I asked her…so, what is sin? How do I identify it? She sort of stared at me and decided this was too big of a question for a person to answer on the run. So, that question has been lingering in me for a while. Until now. And here is the real answer. Sin can only be identified through a personal relationship with God. It’s the Holy Spirit that identifies sin for us. And the ten commandants is not an exhaustive list. Within our hearts lie areas that need fulfillment and sometimes we can use temporary, earthly salves to sooth ourselves. That’s when something becomes a sin. Sin is anything that separates us from God. My sin became noticeably a crutch, something I leaned on for support but ultimately made me weary and exhausted. THE GOOD NEWS is sin can never overpower the work and blood of Jesus. Sin exhausts the flesh and quenches The Spirit. I am amazed at how much more energy I have to complete my daily tasks when sin is removed from my lifestyle. Sin is tricky and can separates us from the will and purpose of our lives. And I’ve noticed it can even suffocate the beauty and opportunities for life and wholeness in my home. Sin can be identified when you notice (the action, belief or feeling) has begun to have power over you. Sin is not a one time mistake. That’s when Grace is sufficient. Sin is a reoccurring crutch the enemy uses to sneak in and take up territory on our inheritance. Sin can cause us to backslide and deteriorate in our identity in Christ. And it’s tricky. Did I already say that? Well, it is. It’s tricky because we’ve gotten good at justification. We’ve gotten really good at comparison and really slack in pursuing the voice of God. Honestly, there have been times when I didn’t want to hear the voice of God. I was afraid of what He might ask of me. But, you know what? His voice and His guidance have always lead me to things that sin can’t even compare to. 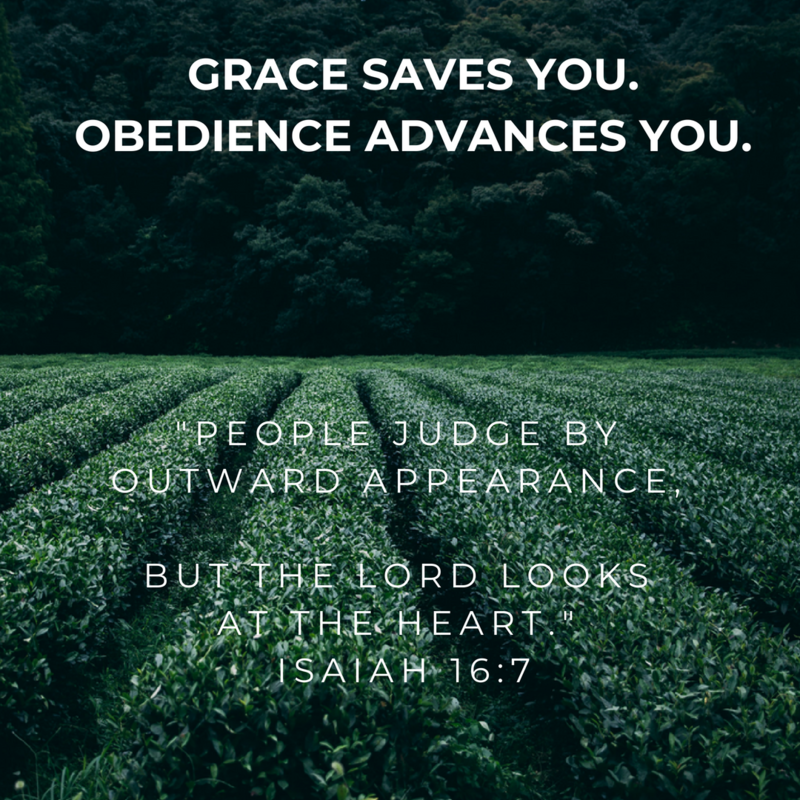 When we allow God to identify a hindering sin in our lives, if we will listen to His voice and obey His commands, we will begin to see life unfold in a new way. Things that we were too exhausted for before, will come alive with strength and beauty. We will have a new perspective and vision for moving forward. Sin keeps us stagnant. Grace saves you. Obedience advances you. He sees the heart. He sees the sin. He sees us in love and will give us as many chances as it takes and He will never stop being there for us. Seek Him. Ask Him to search your heart and show you if there is any offensive way in you. It will be worth the sacrifice. He will bless you. Next Next post: No matter how ugly the story it’s a beautiful story because it’s your story.